"Fresh dill, garlic, and lemon juice bring an authentic taste of Greece to this simple potato recipe." Stir water, olive oil, lemon juice, dill, chicken bouillon, garlic, thyme, rosemary, oregano, salt, and pepper together in a bowl until smooth. 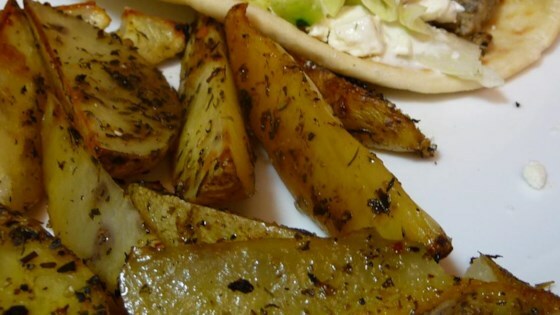 Spread potato wedges into a baking dish. Drizzle the seasoning mixture over the potatoes. Cover the dish with aluminum foil. Bake in preheated oven, turning occasionally, until the potato wedges are soft in the center, 90 minutes to 2 hours. Put a delicious and healthy spin on French fries. They were good a bit too lemony for me. Next time I make this I will at least cut the lemon juice in half and a little less water. Followed the recipe exactly and it was fantastic! The dinner party loves them!